After 21 years of unwavering service to his hometown team, Irish League veteran Glenn Taggart has quit Carrick Rangers and announced his retirement from football. Taggart signed his first contract with the Taylor's Avenue club in July 1996, making his debut against Omagh Town in February 1997. He went on to play under 23 managers in a career spanning two decades. He was an influential figure both on and off the pitch for bosses such as Jim O'Rourke, Nigel Best, Stephen Small, Michael Hughes and Gary Haveron. The midfielder turned defender also managed the club in caretaker capacity on more than a few occasions. Such is his affinity with the Amber Army, an apologetic Taggart wrote in a post on Facebook this evening: "I Glenn Taggart am leaving Carrick Rangers and retiring from football. I feel like I'm letting Carrick Rangers down even writing this but this is not a footballing decision! "I'm still very fit/healthy and proved on many occasions this year that I can still play at the highest level in this country, but this decision is for personal reasons and mainly to spend more time with my family." Taggart helped Carrick win the Championship title twice, the Intermediate Cup twice, the Steel and Sons Cup and the Daily Mirror Trophy during his time at the club. The 36-year-old schoolteacher said he was "very honoured and humbled" to have represented Rangers over the years. 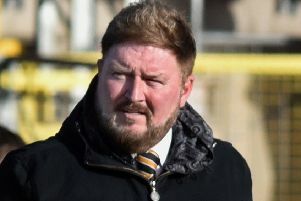 "I've always said no other club could have given me what I've had at Carrick Rangers, not one, and Carrick Rangers will always be my team," he said. "Even though it's the end of this chapter of my life, I'm sure I'll be about the place as part of the Amber Army in the future and look forward to seeing you all again. "I don't know if my best was always good enough for the mighty CRFC but it's my best you got!"